Dennis D. Hotte 1965-2018 CHICOPEE- Dennis “Denney” Hotte, 53, passed away on Tuesday, December 4, 2018 after a long battle with leukemia. He was born in Holyoke on August 13, 1965, a son of Dennis Donald Hotte of Belchertown and the late Marilyn (Rushlaw) Hotte. He was educated in Chicopee schools and later completed tractor-trailer driving school in Connecticut. 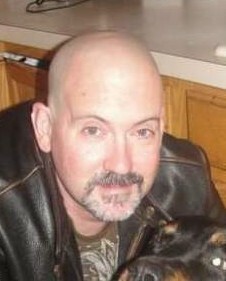 He loved being a truck driver and worked for several companies, most recently with Foster Hill. Denney enjoyed deer hunting, riding his motorcycle, attending church, sightseeing the US while truck driving, watching New England sports teams, and spending time with his family and friends, especially his great nieces and nephews. He will be missed by his father, Dennis Donald Hotte of Belchertown, MA; his brothers, Randy Hotte of Chicopee; Michael Hotte and his wife Denise of Chicopee; his brother, Alan Wilson; his sister, Donna Wilson; his nieces, Sarah Carmen of Agawam and Carrie Hotte of Chicopee; several adored great nieces and nephews and several extended family members and dear friends. He will also be missed by his riding friends, “Road Riders for Jesus.” He was predeceased by a sister, Lisa Hotte. Funeral services will be held on Wednesday, December 12, 2018 at 11am in the Second Baptist Church, 589 Granby Road, South Hadley, MA 01075, followed by a burial in St. Rose de Lima Cemetery, Chicopee, MA. In lieu of flowers, memorial donations in Denney’s name can be made to The Leukemia & Lymphoma Society, Donor Services PO Box 98018, Washington DC 20090-8018. Please visit www.brunellefuneralhome.com for more details.